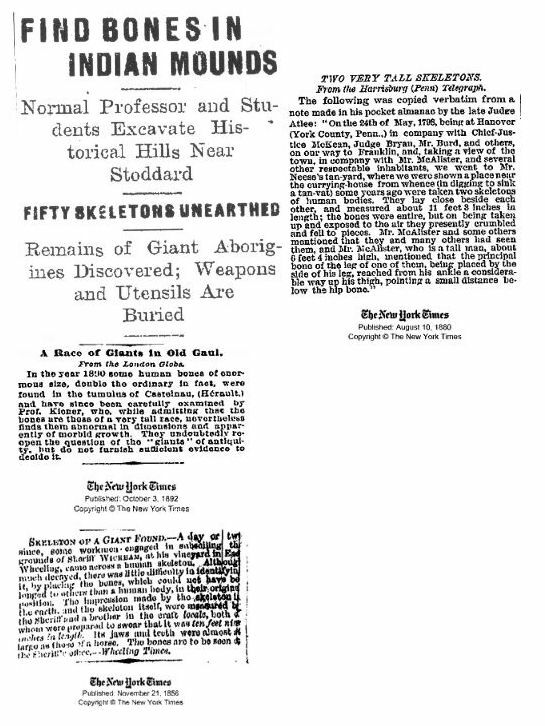 Here's one for your "Forbidden Archaeology" file.Scientists are remaining stubbornly silent about a lost race of giants found in burial mounds near Lake Delavan, Wisconsin, in May 1912. The dig site at Lake Delavan was overseen by Beloit College and it included more than 200 effigy mounds that proved to be classic examples of 8th century Woodland Culture. But the enormous size of the skeletons and elongated skulls found in May 1912 did not fit very neatly into anyone's concept of a textbook standard. They were enormous. These were not average human beings. 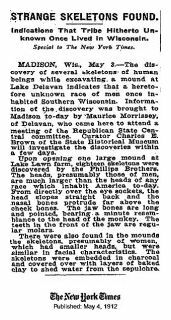 First reported in the 4 May 1912 issue of the New York Times the 18 skeletons found by the Peterson brothers on Lake Lawn Farm in southwest Wisconsin exhibited several strange and freakish features. Their heights ranged between 7.6ft and 10 feet and their skulls "presumably those of men, are much larger than the heads of any race which inhabit America to-day." They tend to have a double row of teeth, 6 fingers, 6 toes and like humans came in differant races. The teeth in the front of the jaw are regular molars. Heads usually found are elongated believed due to longer than normal life span.
" One must wonder how much can they lift if twice the size of a average human today? 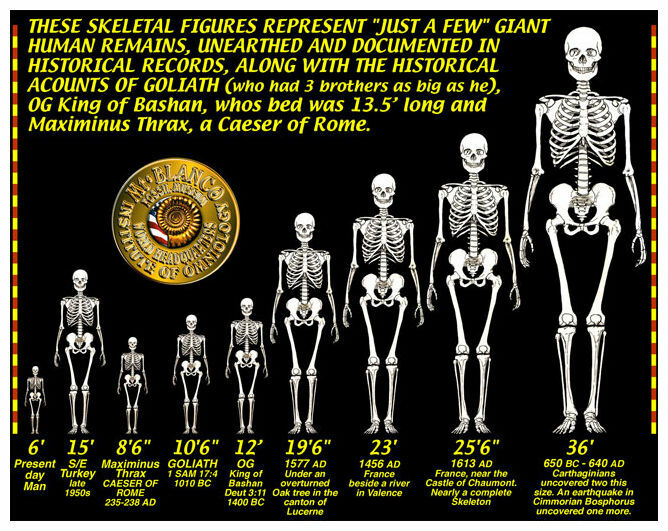 Are these the Giants the Bible & many other civilizations have in their history and painted on their walls. The Bible in Genisis 6:4 " There were giants in the earth in those days; and also after that, when the sons of God came in unto the daughters of men, and they bare children to them, the same became mighty men which were of old men of renown. " Now this is faulty logic to any scientist out there because I am using religous/cultural history to fill a hole in science. Over 200 Giant digs have been found in recent years. Giant skeleton finds have not made the local/national news since the 1950's for the most part. It seems in most peoples opinion do to the fear that people would question evolution . If anything a de-evolution. In 2002, National Geographic reported a dozen Cyclops skeletons found in Greece that stood 12-15 1/2 Ft tall. That is 3 humans tall. One eye socket. Giants in history are typically cannibalistic in nature. The reason why I am bringing up giants will all tie into politics, and word happenings. Look at a basketball hoop and add 5 feet. That tall. Greek Mythology talks about war with cyclops learning they had to bring down by taking out their legs rendering them slow and helpless. American Giants (Red Hair Giants) where found with egyptian writing on their tombs have been found in multiple locations. Was this some sort of prank, a hoax played by local farm boys or a demented taxidermist for fun and the attention of the press? The answer is no. The Lake Delavan find of May 1912 was only one of dozens and dozens of similar findsthat were reported in local newspapers from 1851 forward to the present day. 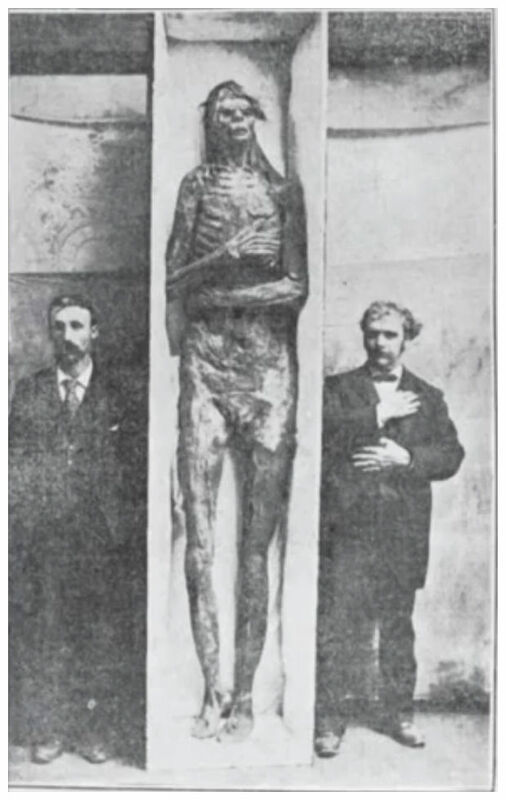 It was not even the first set of giant skeletons found in Wisconsin. On 10 August 1891, the New York Times reported that scientists from the SmithsonianInstitution had discovered several large "pyramidal monuments" on Lake Mills, near Madison, Wisconsin. "Madison was in ancient days the centre of a teeming population numbering not less than 200,000," the Times said. The excavators found an elaborate system of defensive works which they named Fort Aztalan. "The celebrated mounds of Ohio and Indiana can bear no comparison, either in size, design or the skill displayed in their construction with these gigantic and mysterious monuments of earth -- erected we know not by whom, and for what purpose we can only conjecture," said the Times. 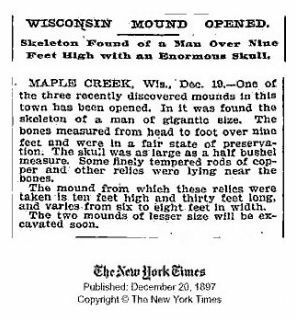 On 20 December 1897, the Times followed up with a report on three large burial mounds that had been discovered in Maple Creek, Wisconsin. One had recently been opened. "In it was found the skeleton of a man of gigantic size. The bones measured from head to foot over nine feet and were in a fair state of preservation. The skull was as large as a half bushel measure. Some finely tempered rods of copper and other relics were lying near the bones." Giant skulls and skeletons of a race of "Goliaths" have been found on a very regular basis throughout the Midwestern states for more than 100 years. Giants have been found in Minnesota, Iowa, Illinois, Ohio, Kentucky and New York, and their burial sites are similar to the well-known mounds of the Mound Builder people. The spectrum of Mound builder history spans a period of more than 5,000 years (from 3400 BCE to the 16th CE), a period greater than the history of Ancient Egypt and all of its dynasties. There is a "prevailing scholarly consensus" that we have an adequate historical understanding of the peoples who lived in North America during this period. However, the long record of anomalous finds like those at Lake Delavan suggests otherwise. Has there been a giant cover-up? Why aren't there public displays of gigantic Native American skeletons at natural history museums? The skeletons of some Mound Builders are certainly on display. There is a wonderful exhibit, for example, at the Aztalan State Park where one may see the skeleton of a "Princess of Aztalan" in the museum. But the skeletons placed on display are normal-sized, and according to some sources, the skeletons of giants have been covered up. Specifically, the Smithsonian Institution has been accused of making a deliberate effort to hide the "telling of the bones" and to keep the giant skeletons locked away. "Modern day archaeology and anthropology have nearly sealed the door on our imaginations, broadly interpreting the North American past as devoid of anything unusual in the way of great cultures characterized by a people of unusual demeanor. The great interloper of ancient burial grounds, the nineteenth century Smithsonian Institution, created a one-way portal, through which uncounted bones have been spirited. This door and the contents of its vault are virtually sealed off to anyone, but government officials. Among these bones may lay answers not even sought by these officials concerning the deep past." The January 13th, 1870 edition of the Wisconsin Decatur Republican reported that two giant, well-preserved skeletons of an unknown race were discovered near Potosi, WI by workers digging the foundation of a saw mill near the bank of the Mississippi river. 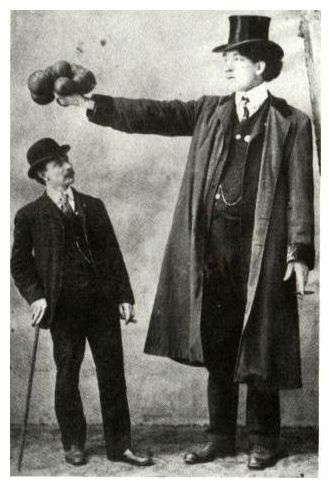 One skeleton measured seven-and-a-half feet, the other eight feet. The skulls of each had prominent cheek bones and double rows of teeth. A large collection of arrowheads and "strange toys" were found buried with the remains. On December 20th, 1897 the New York Times reported that three large burial mounds had been discovered near Maple Creek, WI. Upon excavation, a skeleton measuring over nine feet from head to toe was discovered with finely tempered copper rods and other relics. A giant skeleton was unearthed outside of West Bend near Lizard Mound County Park and assembled by local farmers to a height of eight feet. More about this can be found inWashington County Paranormal: A Wisconsin Legend Trip by local author and investigator J. Nathan Couch. While a normal-sized skeleton of a supposed mound builder (the "Princess of Aztalan") is on display at the site of several large pyramidal monuments near Madison called Aztalan State Park, the goliath remains of Wisconsin's giants have vanished along with the hundreds of others discovered throughout the midwest. Many have accused the Smithsonian Institution of covering up these discoveries, locking the giant skeletons away and depriving the public of their findings.